My wishlist this week isn't about any clothing or product. It's about travelling, of which I'm already planning my next holiday. Seriously wish I could travel more often, it's so much fun going new places and experiencing different adventures. Travel bloggers have it good man. But how do they get money or do they just get a free ride everywhere? Hmm.. I'm gonna have to do some more research. In the meantime, I am throwing it way back to last week Sunday, where I found myself plopped in the Balearic Islands with significant lack of sleep but feeling super excited that I was somewhere new!! Right let me start from the beginning...I got a rather mysterious text from Claire back in April asking me to take specific dates off in June/July but she couldn't tell me why, though she promised I would love it. It took me all of 30 seconds to think about and send my request through to my manager. Now I just had to sit and wait to find out this surprise. And wait I did...Claire was away at the time and wanted to see my face when she told me the news so I had to endure utter silence for 2 weeks!!! The torture!! Oh, but it was well worth the wait as once Claire shared with me the fact that we would be travelling not to one but two locations, all expenses paid, I let a out a little scream. Basically, what had happened is ME by Melia had put out a competition on Instagram and Claire had won, giving her free flights and hotel stay at 2 of their hotels (Mallorca and Ibiza) for 4 nights overall. Oh and some money to spend while out there. Er hello free holiday!!! We both were so excited, the countdown seemed like it took forever. But soon the weekend of travel was upon us and we were both madly dashing around Westfield shopping centre to tick the last bits off our travel check lists. Oh and did I mention I had not even packed yet. That's why I got no sleep, I was up till the early hours of the morning, whirl winding through my wardrobe, trying to find the appropriate "free holiday" attire. I got maybe 30 minutes of shut eye before it was time to head to the airport. I have no complains though as once we got to the ME Hotel in Mallorca, all my worries melted off me. The staff were hugely accommodating, the hotel itself was very sophisticated and I couldn't wait to whip my kit off and bask in the sun (actual real HOT sun)! Before that, the checking in procedure had to occur but it was a rather pleasant experience involving several glasses of rosé at the desk. So after some champagne at reception (and even more in the room), it was time for the usual browse of our suite (yes, suite! ), unpacking and settling in. My lack of sleep mixed with a little too much bubbly, it was most definitely time for some lunch!!! On the beach, I might add. Just look at that view...not too shabby! 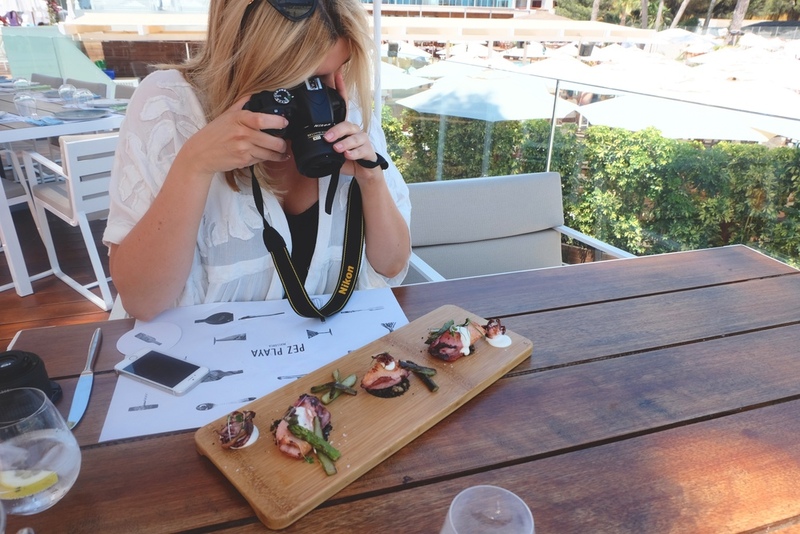 And yes, every meal has to be photographed...I mean when they look that good can you blame us? I could eat seafood till the end of time and in Spain, it's the best of the best. After a very full belly (we ordered the whole menu, I kid you not...it was free after all), it was time to hit the pool and get our brown on. Did I mention this was at our personally reserved Bali beds, with a complimentary waiter donning us with several rounds of free cocktails, while we lounged next to the likes of Mark Wright and overlooking the party happening next door at Nikki Beach? At this point, I had already made my mind up that I was never going home haha.